Me quedé dormido en una playa y la marea vino repentinamente. Luché contra pulpos y monstruos marinos. Una enorme medusa me envolvió en su gelatinosa masa. Pero una sirena con cabello de algas me salvó. Ella me preguntó: ¿Quién eres tú? -Yo soy un soñador, imagino mundos. Dije yo. -¿Puedes imaginar a una sirena con cabello de algas? Me preguntó. -Obvio, -Respondí- Eso es fácil. Entonces ella desapareció como remolino de burbujas, y yo desperté sobre la arena cuando la marea bajó. I fell asleep on a beach and the tide came suddenly. I fought against octopus and sea monsters. A huge jellyfish wrapped me in his gelatinous mass. But a mermaid with seaweed hair rescued me. She asked: Who are you? -Can you imagine a mermaid with seaweed hair? She asked. -Obviously, -I said-, That's easy. Then she disappeared like swirling bubbles, and I woke up on the sand when the tide went down. Thank god, you were saved! 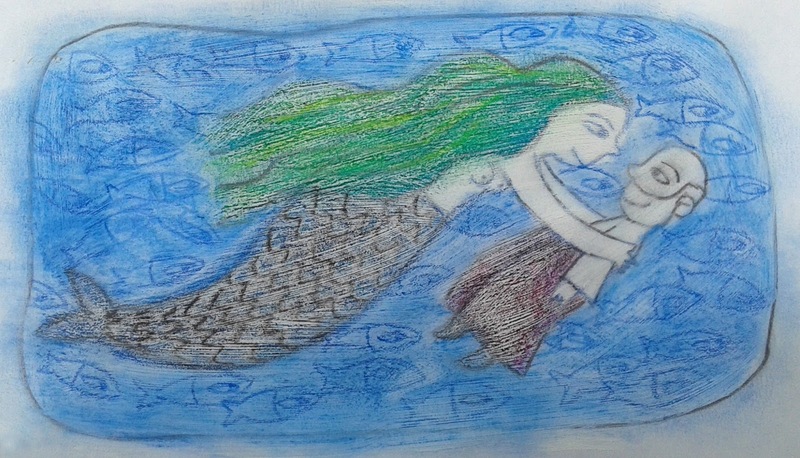 Being rescued by a mermaid: things could really turn out less fortunate. I love the story Roberto! I always enjoy clicking over to visit you. Lucky you weren't drowned, you know. Mermaids do that sort of thing. ;D The other day I saw a young girl with long green-blue hair. I thought she looked a little like a lost mermaid in the city. Great surprise to see your version of the theme! As always, you bring a smile and a chuckle. What a nice visit of the mermaid! or was it a dream? or not, dear Roberto? It feels so real. Your words and your nice drawing/painting! I am in love. What a magical aproach. dream and reality....they are very close together! It seems we are dreaming about similar subjects...haha. So of course, I love your approach and drawing! I'm a huge mermaid fan. and a tiny Roberto perhaps?